Chicken or fish. That's probably what the response card asked from the last wedding or Mitzvah you attended asked you to choose. Is neither an option? While there is definitely a time and a place for a stuffed chicken breast dinner, although I'm still figuring out when that time and place are. My favorite thing this week is interactive dinner options for your guests! There are so many ways to get your guests up and moving at your next event and what better way than by encouraging them to choose their own French fry toppings at a make your own poutine bar, or select custom panini fillings at an interactive panini station. From sliders to skewers, stations are the latest fun dining trend that are here to stay! One of my favorite boutique caterers, Tasteful Affairs in Alexandria, creates custom interactive stations for events that include a savory waffle bar with toppings like panko crusted chicken breast, grilled black forest ham medallions and sliced pepper crusted steak served with a tarragon lemon crème and a honey siracha crème. Linda Harkness, of Tasteful Affairs, designs late night interactive dining experiences for guests that feature mini milkshakes and a slider bar with a variety of mouth watering slider choices. Mini grilled cheese triangles with a basil tomato soup shooter is the perfect passed appetizer, but you can expand this selection and offer it in mugs with full sandwiches as an interactive dinner option. Flatbread pizzas with mouth watering toppings like balsamic drizzled onions and fresh arugula are crowd favorites. Everything on a stick is better! These Baked Alaska brownie sticks are bite size pieces of pure heaven!! Sliders are not just mini burgers anymore! 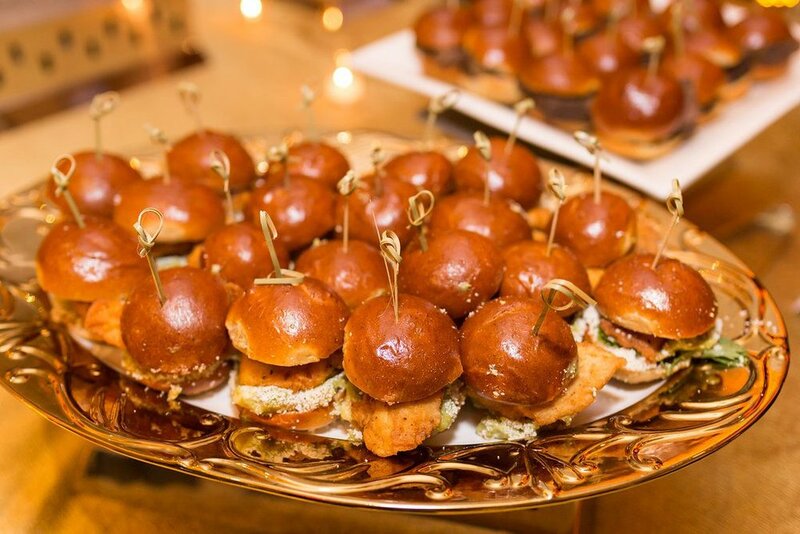 This event featured crispy chicken sandwiches with a homeade aioli and crispy onion straws. Mini Monte Cristo sandwiches and panini stations with made to order melted sandwiches are so much more fun than choosing a chicken or fish plated dinner! Mini lamb chops accompanied by an au jus dipping sauce are the perfect bite size appetizer. This poutine bar combined the hosts cultures of Indian and American. We started with a french fry station and added cutom toppings such as Indian favorite lamb rogan josh and chicken tikka masala to crowd pleasers like cheddar cheese, honey bacon and scallions.